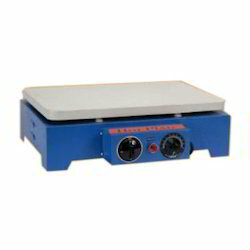 We are a leading Manufacturer of hot plate rectangular, complete ss hot plate, magnetic stirrer with hot plate and hot plate round from Mumbai, India. Wider plate having this Hot Plate Rectangular unit is available for patrons in numerous patterns. Showing quick heating, these products are damage free and prepared by professionals using damage free parts. 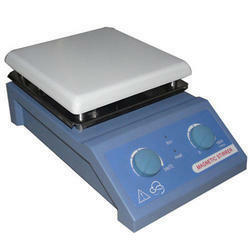 Moreover, we charge lesser price for this hot plate and supply in the market in safe form. Requiring negligible maintenance, these Complete S S Hot Plates are best in finishing and excellent in quality. 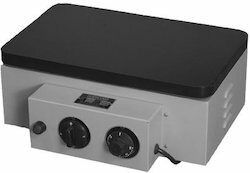 Light weighted these hot plates are damage resistant and work with minimal power consumption. In addition to this, these hot plates are easy to place due to light weight and compact size. Plates are in Rectangular & Round Shapes. Choice of controller either energy regulator or thermostat. Max surface temp 350ºC body made of thick S.S Operates on 230 volts. 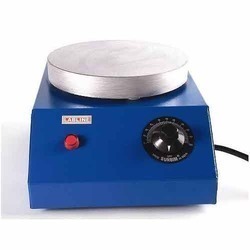 Easy to use, these Magnetic Stirrer With Hot Plates are damage free. Moreover to this, these presented products are properly examined by professionals before presenting in the market. In addition to this, we apply lesser price for hot plate. Customers may avail this hot plate from us in different specifications. We are one of the leading Manufacturers and Suppliers of Hot Plate Round. Hot Plate Round offered by us, is double walled unit with inner chamber and top lid (pyramidal) made of S.S., and outer chamber made of M.S. with powder coating. There is a gap between the walls filled with glass wool insulation to avoid heat loss. The inner chamber of Hot Plate Round is fitted with immersion type heating element. Body made of thick M.S. / S.S.
which ensures air insulation between plate and base unit. Temperature Controlled by energy regulator. To work on 230 Volts A. / C. Only.